Amputations in dogs are commonly performed due to severe trauma, cancer, or birth defects1, 2. The most common level of amputation is where the limb meets the body1. This is contrary to amputations in humans where the primary goal is to preserve as much of the limb as possible while still allowing room for the utilization of prosthetic components such as a foot or hand. Until recently, primary goals of canine amputations included the formation of a well-padded amputation site and removal of the entire residual limb to prevent further trauma to the area and decrease the likelihood of it interfering with movement1. Fortunately, the rise in availability of prosthetic devices for pets has begun to change how veterinarians and pet owners think about amputations. When possible, pet owners now have the option of preserving limb length during the amputation so that a prosthetic device may be used. Without the proper preservation of a residual limb, the attachment or suspension of a prosthetic limb is not possible. Figures 1–4 outline common types of canine amputations along with ideal levels of amputations that allow for the use of artificial limbs. Figure 1. High femoral amputation in dogs. Note the more symmetric and full residual hindlimb area as opposed to the hip disarticulation. The most commonly performed hindlimb amputation is the high femoral amputation which occurs in the upper third of the bone3. High femoral amputations result in a short well-padded residuum. The cut end of the femur is beveled and the remaining thigh musculature is sewn around it, resulting in a hindquarter that is symmetric with the sound limb. The fullness of the hindquarter allows for balance while the dog is sitting and laying down1. Figure 2. Hip disarticulation amputation in dogs. Note the decrease in hindquarter symmetry when compared to the high femoral amputation. A second technique that is used in hindlimb amputations is the hip disarticulation. Rather than transversely cutting the femur bone, it is removed entirely by severing the ligaments and tendons that maintain its position in the hip socket, leaving only the pelvis and surrounding musculature in place. Trauma or cancer in the upper portion of the femur may make this type amputation necessary over the high femoral type. The result is a hindquarter with less padding and a slight asymmetry in its appearance1. Figure 3. Scapulothoracic disarticulation amputation in dogs. The forelimb is commonly removed by means of scapulothoracic disarticulation. It is similar to the hip disarticulation for removal of the hindlimb in that no bones are cut. The limb is removed at the shoulder blade (scapula). The result is a smooth well-padded forequarter1. The limb can also be removed by transecting the humerus, however, the resulting amputation site is not as well-balanced and cosmetically pleasing as the scapulothoracic disarticulation3. Figure 4. Transradial and transtibial amputations in dogs. Lower level amputations such as these allow for the use of prosthetic devices. 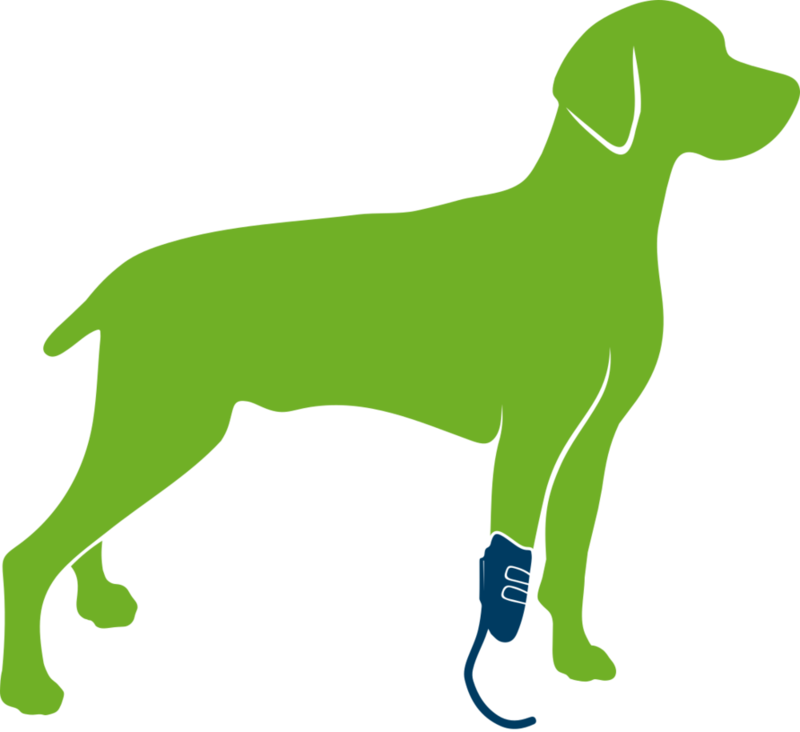 Similar to humans, ideal canine candidates for prosthetic limb use will have a long residual limb upon which the device will suspend. Preservation of the elbow joint in the forelimb and knee joint in the hindlimb, along with maximum preservation of the immediate lower limb segment will lead to the ideal fitting scenario. Long residual limbs are ideal in that they provide a broad surface area for the prosthesis to suspend from, as well as allow for the distribution of pressure transmitted from the device itself. Amputations may occur at other levels of the hind and forelimb, such as through or below the wrist joint or through or below the ankle joint. While preservation of limb length is generally ideal, an overly long residual limb may present issues such as lack of room for the prosthetic foot. Careful evaluation by a board certified prosthetist is important for a successful outcome.